This article on the Long Beach (CA) Grace Brethren Church (Lou Huesmann, pastor) appeared in today’s Long Beach Gazette.com. To read the entire story, click here. Sixteen young adults and members of Grace Brethren Church of Long Beach didn’t need to know a whole lot of Spanish to be able to connect with a group of young orphans from Tijuana last month. It was the church’s first time visiting Mexico for a mission trip, working alongside a ministry called Genesis Diez, A.C., from Aug. 7 through 13. Genesis Diez is a nonprofit organization that aims to provide learning experiences for orphaned and migrant children in Baja California. The group helps boost self-esteem, while teaching the children Christian values. Each member from Grace Brethren Church was assigned to work with one or two of the children for the week. It was member Wisdom Morm’s first time out of the country, and he said he is looking forward to returning to Mexico to continue to help the orphaned youngsters. While understanding each other proved to be somewhat challenging, Morm said he had no trouble finding another way to bond with the children. 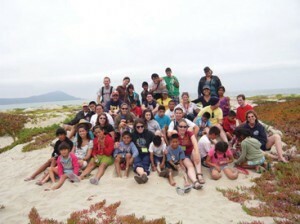 The children’s camp was set on a rural ranch, just outside Ensenada. While there, the children played games, made arts and crafts, participated in a vacation Bible school seminar, and told stories over a campfire. Many of the children had never seen the Pacific Ocean before, and Krohmer and his group made sure they got to visit the beach and take hikes along the mountainside. The church said they hope to rejoin Genesis Diez, A.C. next summer to check up on the youngsters, and continue to spread the love, according to Krohmer. For more information about Grace Brethren Church, visitwww.gracelb.com. The church is located at 3601 Linden Ave.